Posts on the history, traditions and literature of the iwi of the Hauraki region. Pakaru, Pakaru, takahia, au e! 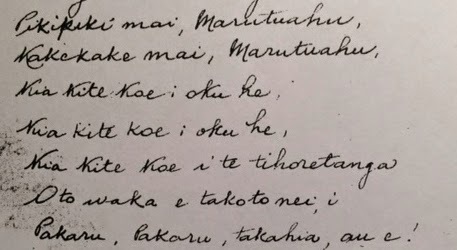 Manuscript by Tukumana Te Taniwha of Ngāti Whanaunga entitled 'Marutuahu'. Tukumana Te Taniwha explains that in 1874, a great hākari (feast) was held by Ngāti Pāoa at Kirikiri, near Kōpū. This hākari was attended by all the Marutūahu iwi including Ngāti Tamaterā, Ngāti Whanaunga and Ngāti Maru. Other closely related iwi in attendance included Ngāti Hako, Ngāti Marama, Waitaha, Ngāti Porou and Ngāti Pūkenga. Various haka, ngeri and tūwaewae were performed including this haka from Ngāti Pāoa. The purpose of the hui was to foster the unity of all the Marutūahu peoples, hence, the tenor of this haka. Tukumana explains that he was 11 years of age at the time and attended as part of the Ngāti Pāoa group. Tukumana also explains that Taipari of Ngāti Maru was particularly taken and committed to the message of the unity of the Marutūahu peoples. He in turn convened a subsequent hākari at his home at Pārāwai, Thames, in 1876. These events were the context in which the creation of the meeting house 'Hotunui' was to take place.